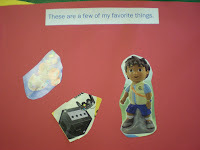 Preschool Playbook: "A Few of My Favorite Things...."
We are continuing with our All About Me theme while also incorporating our colors and this week, apples. We began our day by reviewing the book we read on Thursday, "The Greatest Me There Could Ever Be," by Vicki J. Kuyper. Then we discussed the different things one can "like." 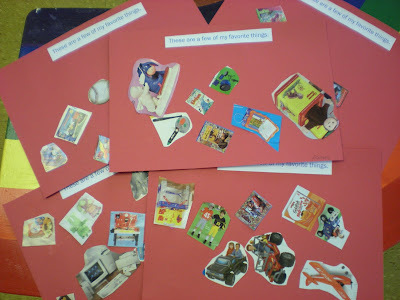 We thought awhile about some of our favorite things and shared them with the class. Isn't if funny how during sharing time they all do like the same things? We made our favorite things page for the ME BOOK. I had cut out many, many, many, different objects from magazines. At this early stage I feel magazine cutting is still a bit out of their league. Some can cut, but some still don't know how to hold the scissors. I like to have scissor centers more at this time so they can get used to having them around. 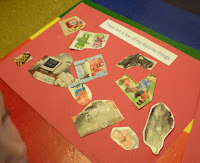 The children can pick as many pictures as they like and glue them on the paper. Some tried to get away with just one, but I tried to encourage at least three pictures, while others could have been there all day. I am going to post about all the red things we did separately, but we also talked about the different kinds of apples that we have. Mostly all the different colors. 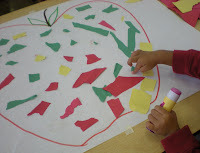 I had drawn a big apple on a piece of paper than put out scraps of yellow, red, and green paper to let the children rip and then glue to the apple. With both classes we were able to get it pretty covered, but there was lots of concentration going on there. I was glad many of the children tried it. We finished the day by going out to the playground. 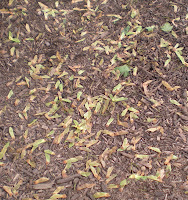 I just had to share with you what fun we were having with all the fallen "helicopters" from the maple tree. 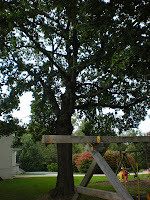 Our playground has a HUGE maple tree in the center of it. Yesterday was really windy and all the "helicopters" were falling to the ground. We were collecting them and throwing them up so they would all spin at once. It was lots of fun and was really neat to look at. I wasn't quick enough to throw and get a picture, but believe me we had a good time. I like that book idea! And the apple looks fun too!